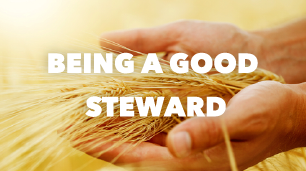 Are we true Stewards of God? In today’s Gospel we are hearing the Parable of the dishonest Steward. Each of us are also stewards to the Lord our God. A steward is a person who manages property or money for the true owner. We are all stewards because God created all and is the true owner of all. Are we true and honest stewards of God within our lives, or are we like the steward in the Gospel reading today? How many times do we see the possessions and resources we have been charged with as our own? How many times do we use these for our own human purposes instead of in the way that God who truly owns them, has entrusted us to use them for his glory? Everything upon the earth belongs to God our heavenly Father, not only material things and resources, but also all of our brothers and sisters, who God also created. You are an amazing God—steadfast in your love, abundant in your mercy, and wise in your actions. You are a wonderful creator God who has provided a magnificent creation with abundant resources for us to enjoy. We recognize our sinfulness and thank you for your mercy and grace extended to us through Jesus on the cross. Your word tells us in James 1:5 that those who ask for wisdom in faith will receive it. Today, we pray for wisdom and for understanding in how to best steward the resources you have given while demonstrating love toward our fellow brothers and sisters. Lord, we desire to be good stewards. We do not want to waste resources or use them selfishly with sinful desires of personal gain. Yet, we understand that the second greatest commandment is to love others as ourselves. As we create policies that help us protect the environment and use our resources wisely, please grant us wisdom that we will not value the created earth over humans created in your image. Please allow us wisdom to create policies and practices that allow for human flourishing all across the globe. Allow us to align our priorities with yours in valuing the souls for which you died more than the resources we steward. Allow us to have a greater passion for the Gospel and spreading the Good News that changes lives than we have for making sure the earth never changes. God grant us wisdom to know when to speak and when to act so that we live in such a way as to glorify you with all of our words and our deeds, and may your name be exalted among every tribe and tongue. In Jesus name we pray through the power of the Holy Spirit.